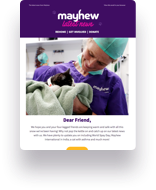 Mayhew offers veterinary training, shelter medicine and management courses to animal welfare organisations from abroad. In Tbilisi, Georgia, our team provide training for the veterinary team at Tbilisi Municipal Shelter. We have donated veterinary equipment to the Shelter Clinic including a heated operating table and a veterinary scrub-sink. We also hold practical workshops in small animal reproductive surgery for the Free Agrarian University, which is the only place in Georgia to offer a veterinary science qualification. Our International Vet Training Programme (IVTP) is designed for veterinary personnel from overseas who are genuinely interested in improving animal welfare in their country. We work with like-minded vets to introduce long-term sustainable programmes for the development of improved animal health and welfare in their local communities. This programme takes place at our Community Vet Clinic in London. The programme covers the basics of preventative veterinary care for cats and dogs with a focus on the needs of animals in a shelter environment or animals living on the streets. Participants can also learn about the management and structure of an urban animal shelter, as well as Mayhew’s community outreach and education programmes. It enables the participants to return to their own country not only with enhanced veterinary skills but a foundation in animal welfare and humane education. This can be built upon to influence the attitudes of their local community and will help relieve the suffering of animals worldwide. A number of Mayhew IVTP alumni are continuing to work with us internationally. Dr Ana Metskhvarishvili provides support to our team in Georgia. Natasha Potapochkina, Valentina Grigorova and Rina Vorobyeva are all now working for Mayhew in Russia. Please consider a donation to help our international projects.